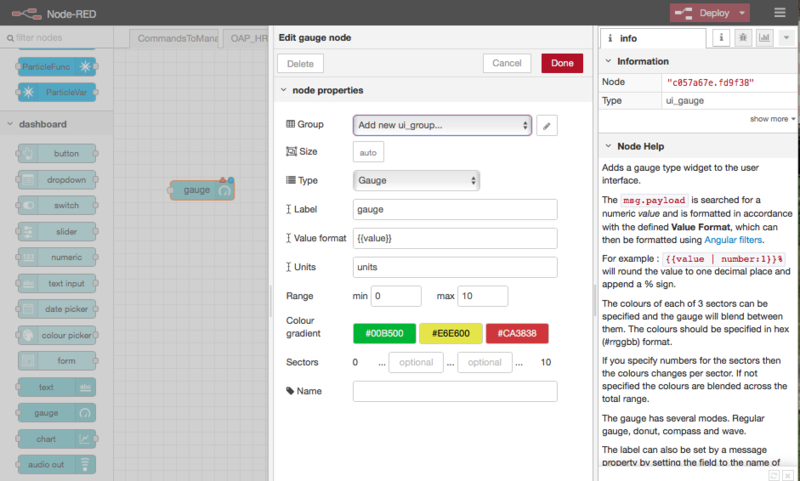 Node-RED is browser-based programming tool for wiring together hardware devices, APIs and online services with drag and drop of pre-configured “nodes” and wiring them together. There are programming tools with similar concepts available in the market, such as Scatch from MIT, focusing on general programming and education, or labVIEW from National Instruments for industrial applications and programming. What’s appealing to many Raspberry Pi users, especially those who are new to programming, are node-RED’s drag-and-drop without the need of programming in most of the time, and the well-crafted dashboard UI widgets, such as gauge, charts, etc..
During the instantiation of the class, you could either use the default configuration settings or customise the configuration by passing in a configuration object as argument. The default configuration is set with an internal configobject with the following values during the instantiation of the Gauge class. The detail API documentation is available at the github page, the picture below help to visualise the meaning of each parameter. D3 renders data by inserting the rendered object into a specific html tag, often specified by a html idtag. We can render the instantiated gauge object by calling the Gauge.render()function. Multiple gauges can be added with different idtag. 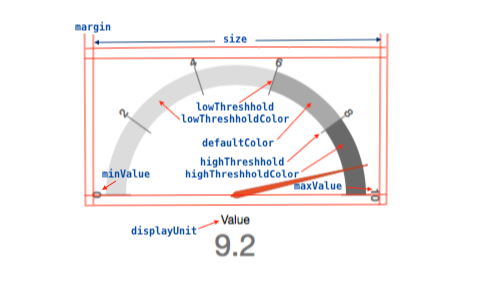 The #gauge-containeris styled as a flex-boxcontainer so that multiple gauges will be align side-by-side based on the viewport setting of the browser. To update the gauge display, you simply pass-in the new value to the Gauge.update()method. And that’s is. Is this simple enough to use it in your projects? 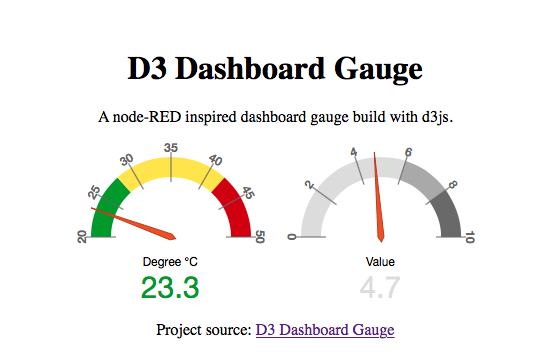 D3 Dashboard Gauge provides an alternative to node-RED gauge if all you need a gauge for your IoT project and your prefer to write your own programming than using node-RED’s drag-and-drop programming style. I’d love to see how you use the D3 Dashboard Gauge in your project, add a comment below and tell me how you use it. D3 Dashboard Gauge is an open source project and is covered by MIT license. Github repository is available at e-tinkers github, there is also a live demo at github.iopage.